The continuing trend for designs of Apple’s devices is to create smaller, thinner iPhones, iPads, and other elements. While this has aesthetic qualities that are desirable, the push to make things as thin as possible also introduces a number of engineering challenges that have to be overcome. Confining components to a smaller area can cause issues relating to heat dissipation. Space is needed to include elements that can transfer heat away, but compact hardware has to rely on other techniques to get rid of the warmth that could harm components like the processor and battery. For hardware with increased mechanical components, such as the influx of foldable smartphones, there is also a need to build in ways to manage kinetic activity. A metal casing may look nice, but it could potentially interfere with a hinge mechanism, leading to damage of the device’s enclosure. 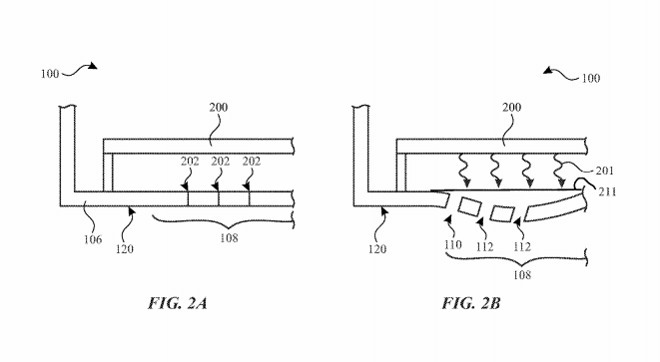 In a patent application titled “Electronic Devices having Adaptive Surfaces” published by the US Patent and Trademark Office on Thursday, Apple’s solution to both problems is to have a casing that can bulge when required. This is not necessarily the usage of fabrics or materials that simply have a level of “give” to them, but for rigid housings, like aluminum used on a MacBook. An exaggerated example of how bulges could be located on a MacBook. One example is to have elements of a MacBook’s rear casing for the lid to have deformable areas that bulge outwards at points where the display components inside can get warmer than Apple would comfortably want in more conventional designs. By bulging out, there is more space opened up around the component for air to circulate, allowing for it to cool down. The bulge itself can be triggered by the heat generated by the component itself, effectively becoming an automatic cooling mechanism. For hinges and other mechanical elements, the bulges can be forced out by being in contact with moving parts. In both cases, the bulges will subside and return the casing to its original form over time, with the casing becoming flat again once it gets cooler, for example. The bulges are created using materials that have a negative “Poisson’s ratio,” namely one that becomes thicker perpendicular to an applied force. For the purposes of the bulges, the change in thickness can be used to define how the bulge appears in a specific point, as well as how far it bulges out from its original position. A cross-section of how the adaptive surface could be affected by heat from a nearby component. As well as simply being flat material, which could have a “bi-stable shape memory,” Apple also suggests the casing’s adaptive surface could be made from a collection of interconnected triangular panels, with the sides of each triangle shortening to create gaps between the sides and corners, and in turn deforming the material. While the applications for such adaptive materials can be for thermal and mechanical reasons, Apple’s use of shape memory-based materials could be used in other ways. 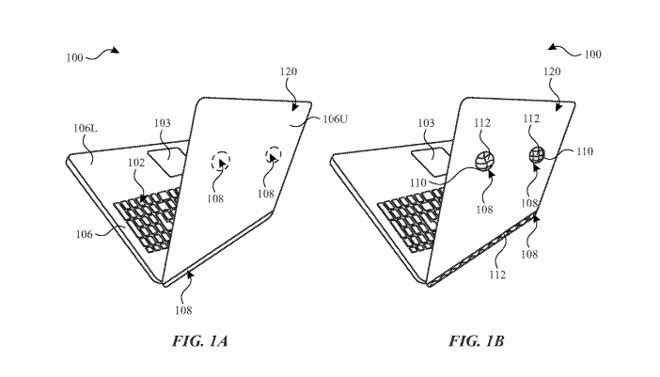 Apple suggests the technology could also be used to create a stand for an electronic device, like feet that can pop out from a MacBook’s base, or to create a handle to carry the device. Apple files numerous patent applications on a weekly basis, and while there is no guarantee that the ideas revealed in the filings will be used in a future product or service, it does advise of areas of interest for the company. Exploring new ways of using materials has surfaced numerous times in the past in Apple patents and applications. Most recently, a February application saw to try and fix the issue of brittle flexible displays being bent in cold weather, by using heat on the most sensitive section of the display. 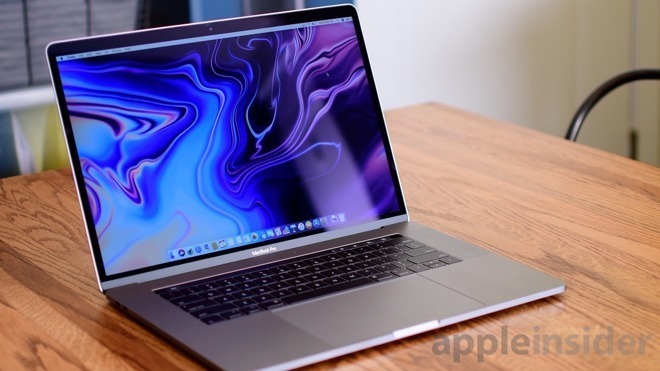 Apple has also explored the possibility of using wrap-around screens, hinged devices, fabric with embedded circuitry elements, using stretchy substrates to connect components together, how to use force gesture controls on flexible hardware, and replacing the MacBook’s keyboard mechanism with glass panel keyboards.